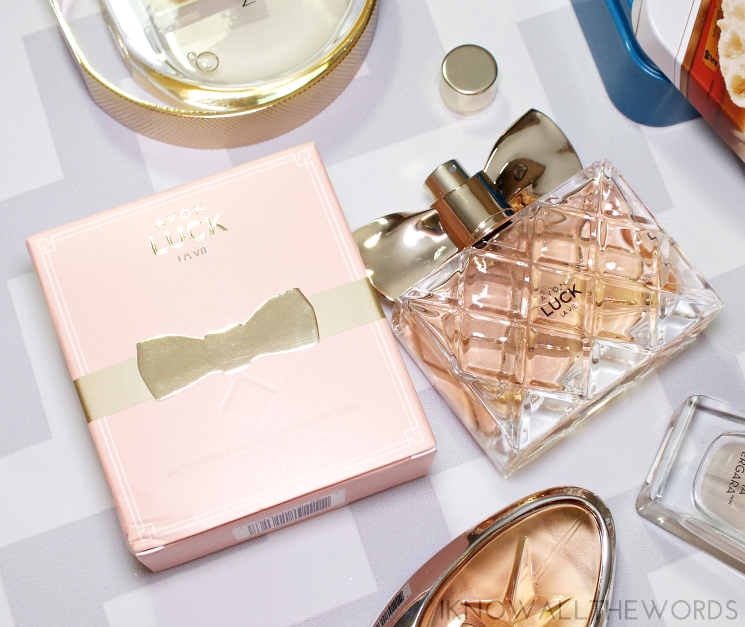 As much as I love Avon, I've never had much luck with their fragrances.Well, save for Luck. It's the one perfume from them that I kind of love. So I was excited to see what the newest version, Luck La Vie could offer. With a blend of 'fresh strawberry, lavish lily of the valley, and warm cedarwood' it's... just okay. It falls short of the original for me, but isn't without it's charms. The strawberry gives it a fresh and sweet note, but the florals of the lily of the valley just don't work for me. Nice, but not my type of scent, unfortunately. I say stick with the original. 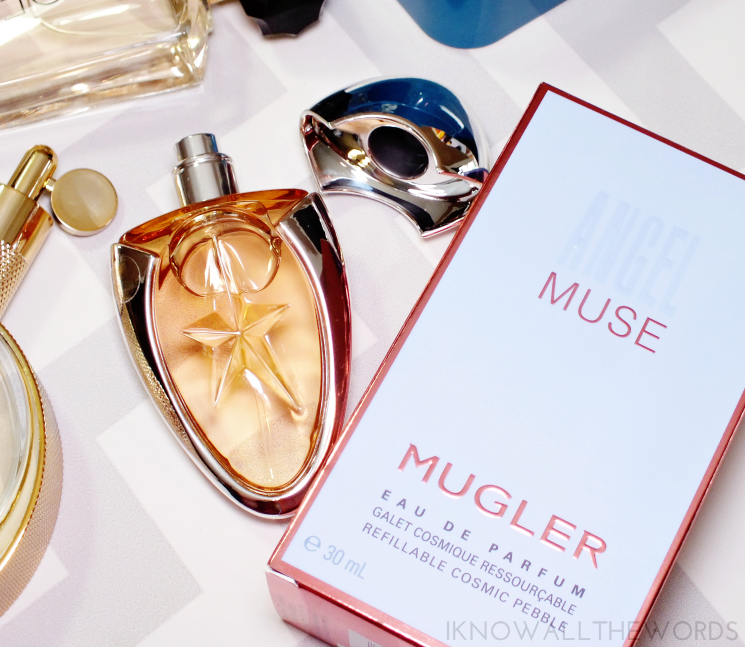 Thierry Mugler Angel is a scent I've always been curious about as a gourmand lover, so I was very excited when Angel Muse launched this year. Hailed as being a new scent genre- the woody gourmand, Angel Muse combines top notes of grapefruit and pink pepper, mid notes of hazelnut cream and rose and base notes of vetiver and patchouli. It's a scent that, to my nose, doesn't develop as you would expect based on the notes and requires time to settle a merge into something wearable. I find when this is first sprayed it's very sharp and rather unappealing, but as it settles, the milky, cream and hazelnut notes come out and a woody sweetness takes over, This scent, while definitely gourmand, lacks he heavy sweetness you may expect, and has a more grown up sexiness to it. I find a warm vanilla note also seems to develop, which makes this a very me scent. 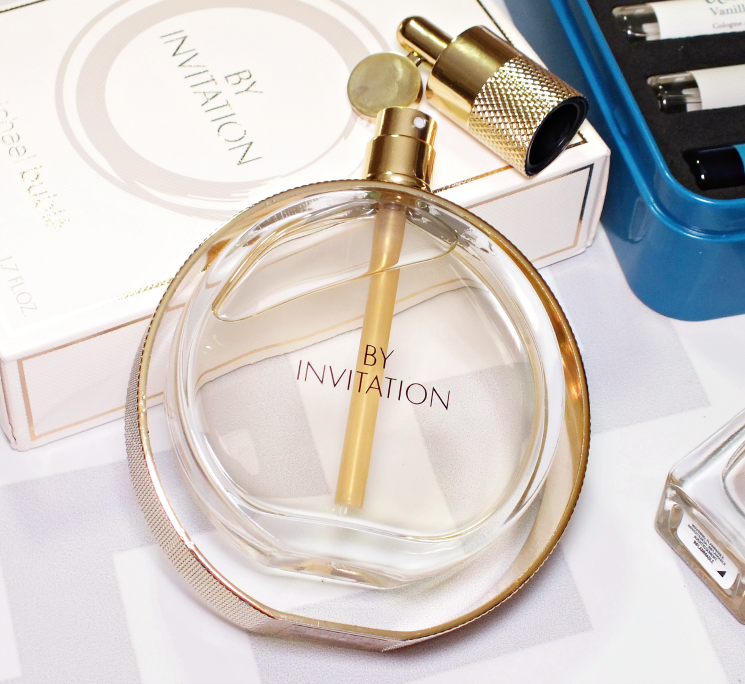 Sofia Vergara collaborated with Avon to launch her very own scent. 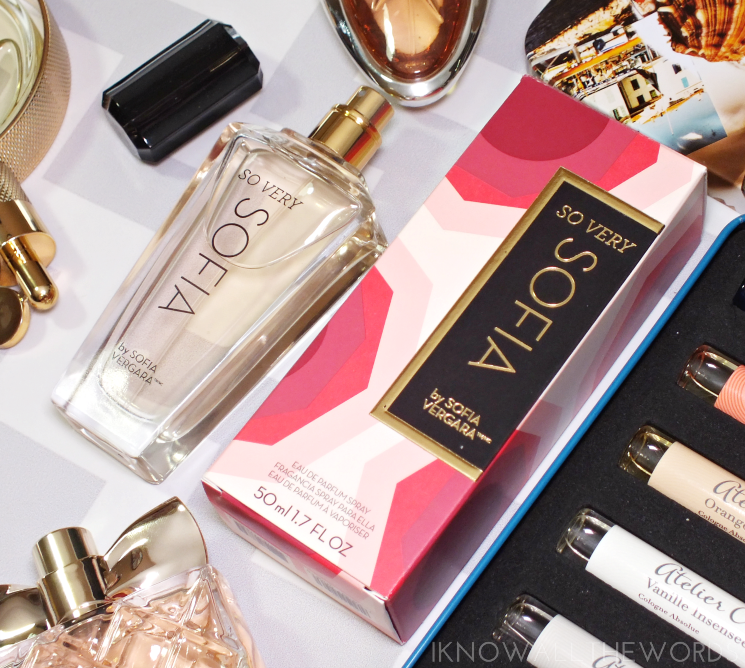 The aptly named (if not very creative) So Very Sofia is a blend of 'tropical passion fruit, exotic Flor de Mayo orchid and bright golden patchouli' that makes for an interesting scent. Somehow, it's not at all what I would expect of Sofia. I was thinking it would be a much more intense, loud, type of scent. It's not though. I actually quite like it. The florals initially dominate (Flor de Mayo orchid is the national flower of Columbia) but the warmth from the patchouli and residual sweetness from the passion fruit come through in the dry down. Sud Magnolia : floral and fresh with notes of magnolia from Louisiana, bitter orange from Seville, and atlas cedarwood from Morocco. Pomélo Paradis fresh and sparkling pomelo from Florida, with notes of blackcurrant bud and Haitian vetiver. Vanille Insensée sweetness of vanilla, jasmine, and fresh lime bonded with rich oak moss, woods, and spicy coriander. Bois Blonds a sophisticated blend of unique and precious woods and incense with orange flower and vetiver. Cèdre Atlas woody and citrus fragrance with notes of atlas cedarwood, lemon, and white amber. 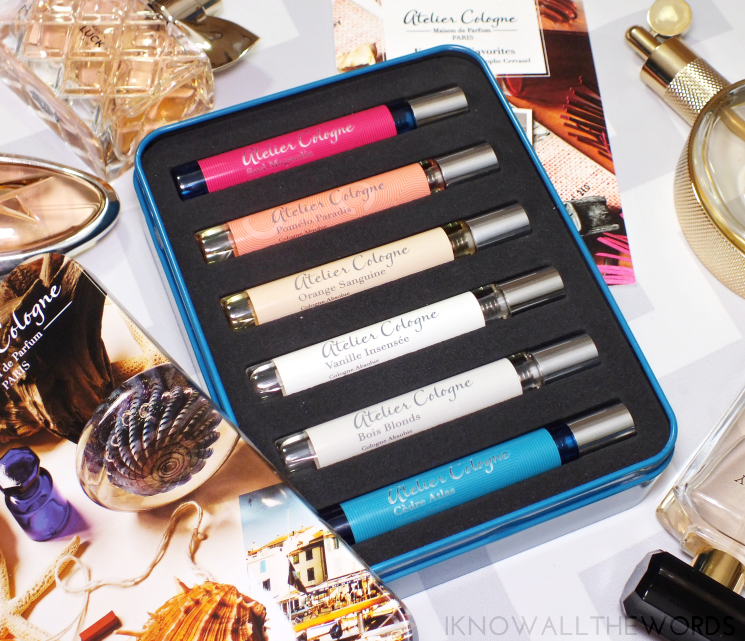 Atelier scents are unisex (although, some do have a more feminine twist, to my nose) and mixable, so you can play with your favourites to create a signature scent. I'm really excited to be able to explore the brand with this set, but do wish their Figuier Ardent scent had made it in as well. Really, who doesn't like fig? Last up, a little Bublé. I can't say his music is my taste, but Michael Bublé By Invitation is a surprisingly great scent. I know, I didn't expect it either. With top notes of red fruits and bergamot, middle notes of lily-of-the-valley, jasmine, peony and rose, and base notes of sandalwood, musk, vanilla and praline, it's not the most creative scent. That said, it comes together to create a nice scent that ticks the gourmand/fruity boxes. It's not a cloyingly sweet scent, but if you aren't a fan of sweetness, it won't be for you, as I find the floral elements are quite sheer and don't come out much on my skin. I love vanilla, and find the base of vanilla comes through very nicely with scent and ties the scent together. Did you guess which scent is up for grabs? I'll give you a moment to mull it over... It's Bublé! I've got a bottle of Michael Bublé By Invitation for one lucky Canadian reader. To enter, simply leave me a comment telling me what your current favourite scent is and fill in the Rafflecopter widget. Giveaway ends Dec. 31st. Canadian residents only. Are you planning on gifting or asking for any scents this year? Tried any of these?